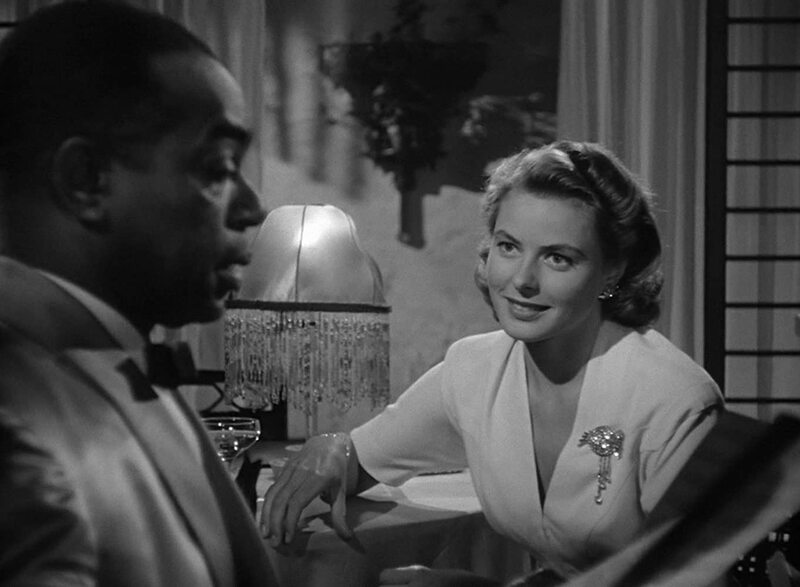 Is there a more iconic moment in all of cinema than when Ingrid Bergman glances at Dooley Wilson with her big, beautiful eyes and says “Play it, Sam. Play As Time Goes By”? Is any single conclusion as often recalled as Humphrey Bogart and Claude Rains and their “beautiful friendship”? The truth is that in the history of film only a small handful of movies have had the staying power that seems to be established around Michael Curtiz’s Casablanca. In it is every bit of pessimism and bleakness surrounding World War II and yet a poetic reminder of the staying power of love, even if the romance itself is fleeting. The peculiar thing about Casablanca’s immortality among classic movie buffs is its lack of interest in experimentation of any kind. It doesn’t deviate from the norm in its camera techniques and doesn’t have many significant technical departures from other major Hollywood productions of the era. Instead Casablanca has stuck around on the basis of its incredible cast and one of the greatest screenplays ever written. The scene when Ilsa (Bergman) first arrives at Rick’s (Bogart) bar is one of my favorites in any film. It is a compactly written yet deliciously indulgent sequence in which seemingly years of backstory is divulged in minutes amidst the tension of lost lovers reuniting and the uncomfortable unawareness of everyone around them. Claude Rains, known for his own adept handling of romantic leads in films like Brief Encounter, somehow finds himself brilliantly executing on the role of comic relief as military Captain Louis Renault. The script also delivers on some of the most famous lines in all of cinema history which has probably driven Casablanca’s longevity. An impressive six of the quotes on the American Film Institute’s 100 Years… 100 Movie Quotes list come from Casablanca. The film has that wonderful Hollywood way of delivering quips that nobody would ever actually come up with on the spot with great relatability. The framing of the characters on camera is another of Casablanca’s great contributions to cinema, particularly the way that Ingrid Bergman is photographed throughout. Shot in close up with glossy eyes, Bergman resonates pure beauty. Watching Casablanca, it’s hard to wonder how anyone could avoid falling in love with the charming Ilsa. It’s not just her looks that give her that magnitude. Her composure and expressiveness are gut wrenching as you feel her conflicted feelings for both men she’s involved with: Rick and her husband Victor Laszlo (Paul Henreid). In fact, Bergman is so spectacular in Casablanca, it regularly calls into question whether her stellar surrounding cast has the chops to rise to her level. Certainly Bogart and Rains and Henreid were great actors of early Hollywood, but Bergman is nothing short of a goddess. Beyond the great script and the incredible cast, I think the thing that has kept Casablanca in our minds and hearts for the longest is that it’s one of the few early Hollywood films that doesn’t necessarily have a happy ending. Movies in the 40s were so often restricted by the Hayes Code’s stringent morality guidelines that films where the audience didn’t get a happy union between its two romantic leads are few and far between. In Rick and Ilsa’s separation we get a taste of humanity and a sense of loss that we don’t expect from this sort of film. In Rick’s sacrifice for the good of the one he loves, we understand that love is not always a recipe for assured happiness. It is that feeling of sorrow that has burrowed so deeply into our souls and has enabled Casablanca’s lasting power.